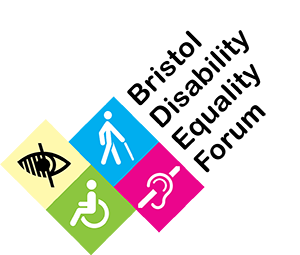 Bristol Disability Equality Forum is an organisation of, and for, Disabled people – whatever their impairment(s). Full inclusion of Disabled people in society. The social model is the idea that it is not our impairments that disable us, it’s other people’s attitudes and the way society is organised that is the problem. For example, buildings with steps to the entrance instead of ramps and information that is not accessible.